The Youngstown State football team had five student-athletes named first-team All-Missouri Valley Football Conference while a total of 13 received all-conference accolades, the league announced on Monday. The five first-team selections are DE Derek Rivers, DE Avery Moss, FS LeRoy Alexander, TB Martin Ruiz and OG Brock Eisenhuth. Earning second-team All-MVFC honors are SS Jameel Smith, LB Armand Dellovade, OT Justin Spencer, P Mark Schuler and return specialist Darien Townsend. The Penguins who were named honorable-mention All-MVFC are OT Dylan Colucci, TB Jody Webb and CB Kenny Bishop. The five first-team picks are the most for the Penguins since 2006 when they had 10 first-team recipients. Alexander was a repeat first-team all-league selection while Ruiz had earned second-team honors as a freshman and sophomore. He is the first YSU running back to be named first-team all-conference since Jamaine Cook in 2011. It marks the second time that the Guins had two defensive linemen named first-team all-conference in the same season. Jim Phelan and Savage both earned first-team accolades in 2006. Other notes: Three of the five starting offensive lineman earned some type of all-league recognition. Dellovade and Spencer were honorable-mention all-league picks last year. Webb was a second-team all-league recipient in 2015. 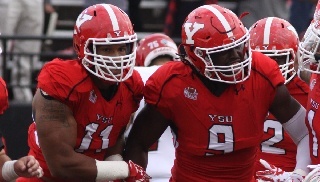 YSU plays in the second round of the FCS Playoffs on Saturday at Jacksonville State. Kickoff for the contest in Jacksonville, Ala., is set for 2 p.m. Eastern/1 p.m. Central time. Eclipsed the 1,000-yard mark for the third consecutive year with 1,008 in the regular season…in MVFC play rushed for 706 yards on 132 attempts…had six rushing touchdowns, highlighted by a three-TD effort at Missouri State…had four 100-plus yard rushing performances…had 183 vs. MSU, 165 vs. Robert Morris, 151 vs. Indiana State and 100 vs. UNI…scored twice against South Dakota and had game-winning TD vs. UNI…for his career has 4,161 yards rushing the second most in school history. Started all eight conference games at guard after missing the non-conference slate because of an injury…made an immediate impact on the line once returning from injury…as a unit, YSU ranks seventh in the FCS in rushing yards per game averaging 260.5 yards per game…in MVFC play, the Penguins averaged a league-best 248.0 yards a game…TB Martin Ruiz rushed for more than 1,000 yards…the Guins started three different QBs and had four play during an 8-3 season… played every snap in six of eight MVFC games. A two-time first-team All-MVFC selection had 37 total tackles, 31 of which were solos, starting all 11 games at defensive end…had 10 sacks, 12.5 TFLs and added 15 quarterback hurries…also had two forced fumbles…in MVFC games had 30 tackles (24 solos), with eight sacks, 9.5 TFLS and nine hurries…had sacks in seven games with a season-high three at Illinois State…also had two against South Dakota…had a season-best seven tackles, including six solos vs. SIU…is the school's career leader with 36 sacks. Had a breakout year with 42 total tackles, 28 of which were solos, and 10 sacks…tied for the team lead with 12.5 TFLs and had a team best four forced fumbles…in MVFC games, had 32 total tackles, including 19 solo stops…registered eight sacks in league play with four hurries and three pass breakups…led the team with 10.5 TFLs vs. league foes…had sacks in seven games overall with a high of three against Indiana State…had five or more tackles on six occasions…had 25 tackles last season before starting all 11 games this year. Finished with 50 total tackles, including 36 solo stops…had a team-high three interceptions, all of which came in league play…in MVFC play had 39 total tackles, with 26 solo stops and 4.5 TFLs…had interceptions against Missouri State, South Dakota State and North Dakota State…had a season-best 11 tackles against Indiana State…had seven at West Virginia and Missouri State and six at Illinois State…had 30 tackles in the final five games of the year….was a first-team All-MVFC selection in 2015. Started all 11 games at left tackle…as a unit, YSU ranks seventh in the FCS in rushing yards per game averaging 260.5 yards per game…in MVFC play, the Penguins averaged a league-best 248.0 yards a game…TB Martin Ruiz rushed for more than 1,000 yards…the Guins started three different QBs and had four play during an 8-3 season…played every snap in six of eight MVFC games. Had 16 punt returns for 229 yards and 10 kickoff returns for 194 yards…averaged 14.3 yards per punt return and 19.4 per kickoff return…in MVFC games had 12 punt returns for an average of 16.9 yards…returned a punt 79 yards for a touchdown in win over Indiana State and was named National Special Teams Player of the Week…had a 45-yard punt return against UNI…longest kickoff return was 39 at West Virginia…had 774 all-purpose yards on the season. Started 10 games was second on the team with 61 total tackles, including 45 solo stops…had two interceptions, 4.0 TFLs, two sacks, three pass breakups and two QB hurries…in MVFC play had 44 total tackles, including 32 solos…had sacks against Southern Illinois and Missouri State…had interceptions against South Dakota and Indiana State…season-high 12 tackles at West Virginia…credited with 11 stops at South Dakota State…had eight solo tackles vs. UNI…had 36 tackles in the final five games. Averaged 43.1 yards per punt on 48 attempts…had 15 punts of 50-yards or more…placed 19 inside the opposition's 20-yard line….in MVFC games, averaged 45.5 yards a kick on 31 attempts…placed 11 of 31 kicks inside the 20 and had nine of 50 yards or more…had a 62-yard punt vs. SIU and a 61-yard boot vs. Indiana State…had a punt of 49 yards or longer in eight games…YSU's punter averaged 36.5 yards a year ago. Started all 11 games at linebacker…led the team with 74 total tackles and 51 solo stops…was also tops with 23 assisted tackles…had 8.5 TFLs, four QB hurries and two sacks…in MVFC play had 60 tackles, including 39 solo tackles…had 6.5 TFLs in league games…had a season-high 10 tackles at South Dakota State…had at least six tackles in every conference game…had eight solos against SIU. Ran for 673 yards on 111 carries and caught 22 passes for 246 yards in nine games played…in MVFC contests had 577 yards rushing on 100 attempts and led the Penguins with 20 receptions…had 200 yards receiving…saved best rushing efforts for last with 167 yards against Southern Illinois and 166 at Missouri State. In first year as a full-time player started 10 games and played in all 11…had 33 total tackles, 31 of which were solo stops…in league play had 24 tackles, including 23 solo stops (only one assist)…great tackler in space…had seven pass breakups, second best on the team…returned a sack-fumble 19 yards for a touchdown at Missouri State…had six solo stops against Southern Illinois and five solos vs. Illinois State…had two pass breakups against the Redbirds and two vs. UNI…had first career interception vs. Indiana State. Started all 11 games at right tackle…as a unit, YSU ranks seventh in the FCS in rushing yards per game averaging 260.5 yards per game…in MVFC play, the Penguins averaged a league-best 248.0 yards a game…TB Martin Ruiz rushed for more than 1,000 yards…the Guins started three different QBs and had four play during an 8-3 season…played every snap in six of eight MVFC games.